Catalogue of Organisms: What is a Daddy-Longlegs? 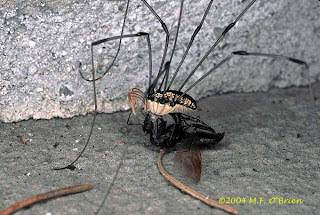 First are harvestmen of the order Opiliones (picture from UMMZ). Harvestmen are often confused with spiders, but the body is not divided into a cephalothorax and abdomen, the opisthosoma (the posterior part of the body corresponding to the abdomen) is externally segmented, the chelicerae (mouthparts) are pincers rather than fangs, and harvestmen do not produce silk. 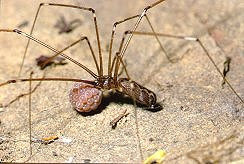 The name "daddy-longlegs" as applied to harvestmen usually refers to the group known as "long-legged harvestmen" (Palpatores). There is some uncertainty about whether Palpatores are a monophyletic group, but that's a subject for another time. Second are spiders of the family Pholcidae (picture is from Iziko Museums of Cape Town - the object the spider is holding is the egg-sac, which is carried by the female until the eggs hatch). Pholcids are true spiders, and so have a divided body, an unsegmented abdomen, fangs, and produce silk. Here in Australia and New Zealand, the 'daddy-longlegs' that are almost ubiquitously found in houses (particularly bathrooms) are pholcids, most often the introduced Pholcus phalangioides. Offhand, there is a common belief that daddy-longlegs (either pholcids or Opiliones) are "the most poisonous spiders in existence, but their fangs are too small to pierce human skin". I have come across this story many times, and have even been assured of it by people who really should know better. This story is absolute bunkum. The University of California, Riverside site has more info. Finally, the third group accused of being 'daddy-longlegs' are crane flies of the family Tipulidae (picture from Wikipedia). Crane flies look a bit like giant mosquitoes, but they are not blood-suckers. They are a large family - the adults are nectarivores or do not feed, while the larvae, commonly called leatherjackets, feed on vegetation. Crane flies are easily distinguished from the other 'daddy-longlegs' - the wings are a bit of a give-away. To me only the first one is a "daddy longlegs". The second is "one of those wispy-legged spiders" and the third is a "mosquito eater". I never heard of crane flies as being called daddy-long-legs. I mostly associate the harvestman as a DLL. We have them all over our backyard. My son tries pick them up and gets real confused that he only gets a leg. Back in New Zealand, 'daddy-longlegs' usually means option two, the pholcid. As I said, they're pretty universal in houses over here. 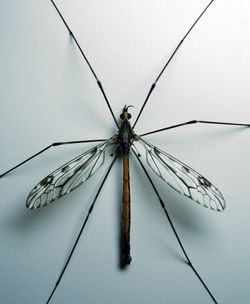 Calling crane flies 'daddy-longlegs' is a British tradition, I think, and it's not unknown in New Zealand. like many things, there certainly seems to be geographic variation here - in the US I've only ever heard harvestmen referred to as DLL. The crane fly I call a crane fly. Though it is amusing to watch how some people freak out when they see one and assume it is one mutha of mosquito! I haven't heard a more specific common name given to Pholcids other than "spider" - perhaps a "cobweb spider"? I imagine that Pholcids and harvestmen are often clumped together by the non-taxonomically gifted so it wouldn't surprise me if Pholcids were also called DLL wherever harvestmen are. That's cleared up a lot of confusion on my part. Thanks! I second the part about clearing up confusions, since I wasn't even aware of these differences. Over here (Sweden) AFAIK we call the Opiliones "longleg-spiders" (usually knowing they are not spiders). I was vaguely familiar with the english term "harvestmen" though. Crane flies we have, but I'm not sure we have any specific name for those. "Giant-mosquitos" perhaps (and again usually knowing they are not too closely related). Looks like one could do an interesting little mini-study about the geographic variation of labels. I'm from California, US originally, and we definitely called the crane flies "mosquito hawks" (I always assumed they ate mosquitoes...now I've got to look it up! ), and I'm pretty sure I've never seen an Opiliones before - pretty sure the pholcids are my DDLs too. They definitely seem more common in bathrooms, and we have a sort of old wives tale/local folklore that they are "good" spiders because they eat black widows. I think these are the longish-leggedy spiders people are appropriately afeared of in the USA at least, the "aggressive house spider" -- which really looks nothing like a pholcid. A few people have told me about the "mosquito hawks". It seems a pretty awful name to me - they're not mosquitoes and they not very hawkish. 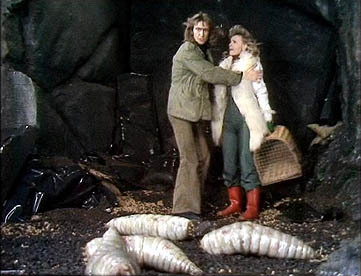 Andy: I have heard the suggestion that the myth of pholcids' extreme toxicity is derived from their feeding on black widows and other toxic spiders, and people assuming (incorrectly) that they must be even more toxic to kill such prey. However, I've also heard that the myth originally applied to Opiliones, and derives from the evil smell some of them produce when threatened. I have no idea what the true origin is. Hank: The vibrating behaviour you mention is widespread in web-building spiders. I have seen pholcids do it, and also orb-weavers. It is probably meant to dislodge anything from the web that is inedible and/or too large to deal with. Heh, we call them misquito-hawks because hawks are known for their hunting skill and the 'crane flies' hunt misquitos. Hence, misquito hawks. 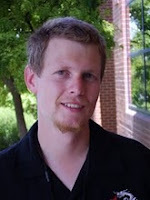 Kah: I can't explain the spacing of clumps (maybe there was spacing of suitable spots to clump), but clumping behaviour is very common in harvestmen, long-legged harvestmen in particular, and clumps containing more than one species have even been recorded. Sometimes harvestmen clusters can be quite spectacular - the largest recorded cluster was of a Leiobunum species on a candelabrum cactus in Mexico and contained about 70,000 individuals. Such 'super-clusters' may be multiple layers thick, with upper layers clinging onto the individuals in the lower layers. The reasons for clustering in harvestmen remain unproven. They are most often regarded as defensive, especially as a major component of harvestmen defences are vile-smelling secretions which would be even more effective if produced en masse. However, clusters may also function to, for instance, reduce water loss. FYI, I've heard a variation of the "most poisonous spider" story about opiliones here in Sweden. Specifically, it was claimed that their bite would be lethal if it weren't for their jaws being too weak to pierce human skin. Hey!!! I have done research (a little bit) to find out why they group together, the daddy long legs, but can't find out anything. The one's I refer to are orange and appear round-bodied. I see them on the porch in Missisisppi when I visit my friend. Any ideas??? For moisture - harvestmen are rather prone to desiccation and require fairly humid habitats, though they can live in dry habitats if there are damp refugia (such as under rocks) for them to roost in. Clusters may form simply as a side-effect of the uneven distribution of suitable retreats, and/or the numbers may help in maintaining humidity in retreats. For protection - if you're one of a large group, then the chance that you as an individual rather than another individual gets taken by a predator is lowered overall. Also, it may be harder for a predator to take individuals from out of a cluster than a solitary individual (this is why small fish such as anchovies travel in large schools, for instance). Also, all harvestmen have defensive odour-producing glands of varying levels of strength, and having a large cluster of individuals all producing bad smells will make that smell all the much worse. Crane flies are called daddy-long-legs in England (at least when I was a child). Harvestmen were just called harvesters. mosquito fly,s are discusting who hates mosquitos? i defently hate mosquitos.